The Mop fly has been around for a while but last year sparked controversy as it cleaned up (sorry) in river competitions in the US. This led to vociferous debate and a certain amount of anger from the traditionalists. Here in the UK the fly appears to be seen as a stockie bashes weapon, not for consumption by discerning anglers. There seems to be a stigma attached that makes its use frowned upon and tyers risk ridicule if admitting they tie and use it. That said it is not a bad fly for a beginner to attempt and it certainly catches fish. OK so why write about it if I find the whole thing uncomfortable?. Well it is simple. 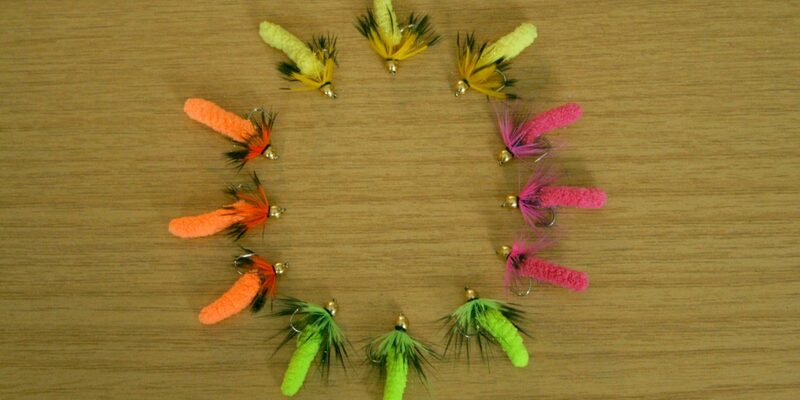 There are so many poorly constructed Mop flies appearing on the social media pages that I felt the need to redress the balance and try to remind people that it should be about the fly tying rather than the use of the fly and that they should strive to tie a decent mop fly! For the two or three hermits amongst you who have yet to discover the delights of microfiber cleaning mitts, a quick description of the main material is in order. I first found this material on a car cleaning glove in a WalMart in Florida. Iâ€™m not proud of going to WalMart, but at least Iâ€™ve not featured in any of the â€œWalMartian â€œgalleries on Facebook as yet. Anyway $3 got me a large green micro fibre mitt. The cleaning area was made up of fingers of furled microfiber chenille sewn into a cloth glove. am, assured they do exist. Not all gloves are the same. The quality of the microfiber used and the tension under which it is furled are important considerations. As a basic rule of thumb, the softer and floppier the fingers are the less useful they are for fly tying, as the fingers tend to fall apart very easily. To use the fingers, simply cut them from the glove or pad. That appears easy but there is a knack to it. Cut too high and it all unravels. Cut too low and the one next to it unravels and you cut the cloth. I simply turn the glove inside out, remove any lining and reveal the underside. Here you will see that the fingers are stitched together in neat rows. Simple cut the chenille where it lies flat on the inner of the glove. Do this to two , side by side and finger in the middle will pull out with its â€œrootâ€ attached. This makes it much less liable to unravel. To tie in the finger, you will need to strip the root off and expose the core threads. Usually there will be 4 threads as each bit of chenille has two and it is of course doubled. When tying in make sure you catch all 4 of these threads. 2) Choose a large brass or tungsten bead. These fingers float like corks and at least a 4mm bead is needed to get them to sink readily. Here Iâ€™ve used a 4.5mm. Secure the bead. Usually the hook shank beneath the bead is built up until the bead fits tightly but the large hole makes this tedious so I have simple tied in a bit of wool and tied it behind the bead very tightly compressing the bead against the hook eye to ensure there is no movement. 3) Tie in your finger of chenille, make sure it stays on top of the hook. If you tie it in to the side the fly will spin like a propeller and twist your leader really badly. 5) Attach and wind a soft hackle. I’ve used my favourite feathers from a Whiting Black laced hen saddle, colours to match or enhance the body colour. Whip finish and varnish behind the bead n.b. I don’t normally like to see the tying thread behind a bead but with the size of this bead I wanted to make sure it remained secure so added a couple of extra wraps. That’s it, now I think you can agree that it is a fly, as fly tying techniques have been applied to construct it. No glue and some proper feathers! Fishing the thing requires a good casting action, do not hit your prized sage with this baby. Fish it in a sink and draw motion, long pulls, long pause and repeat. In clear water watch as fish rush over to investigate. Often you can hear them laughing but every now and then it is eaten with gusto, even when sitting static on the bottom of the lake. Go on try it and let the editor know how it works for you. She promises not to reveal your name either!. Other photos can be used as heading or possible cover pic?